…from our passion for viticulture and the merging of our respective companies. A young winery, based on the production of quality wines without the limits of tradition. Development and innovation converge in the bottle to give life to new wines, with the help of lands that are historically suited to the production of wine. The Rivata company was founded by my grandfather in the 60s in the municipality of Guarene. He mainly cultivated arable crops and raised cattle. As the years went by and the generation change took place, production steered towards vineyards and orchards as well. The rearing of calves continued until roughly 2010, after which we decided to devote ourselves full time to the land. Angelo Borgogno’s winery, my uncle’s company, was founded in the late ’70s, while renting a vineyard in Cerequio. 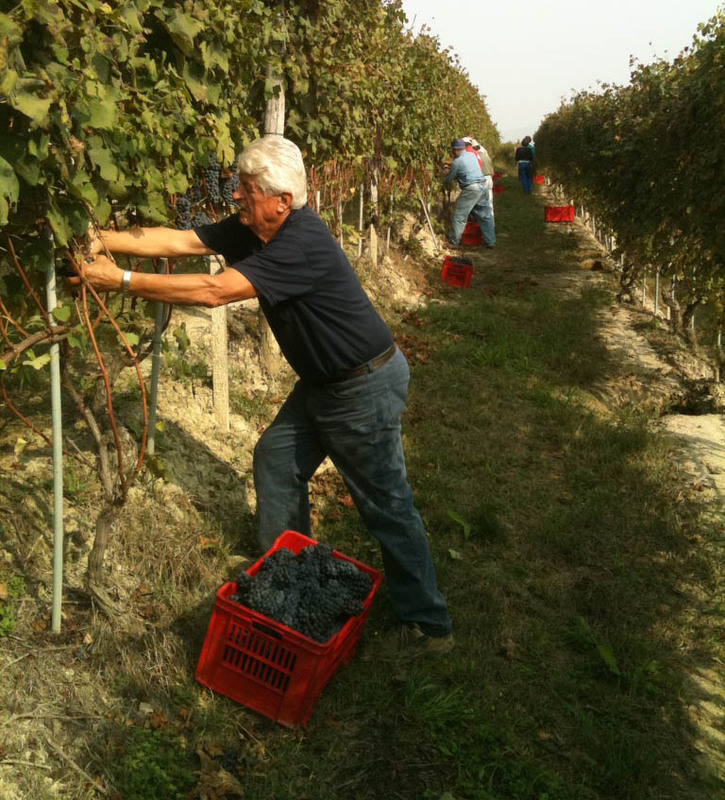 Of the eight Borgogno brothers, Angelo, my uncle, and my father were the only ones who worked actively in the winery. They cultivated exclusively Nebbiolo vines and, despite the small family production, they also made Barolo wine. Through my father, the company grew and began buying their own vineyards. In 2010 we decide to join our companies: in both families there is a strong link with wine, but in a land rich in historic cellars we believe in the need for a different interpretation. Having come to know the French phenomenon of the 1990s, the so-called “garage wine” of the Bordeaux area, we get the idea: why compete with the “Barolisti”? Our dream is a small production, representative of the territory of Langhe and Roero, but free from the limitations and rules of tradition. So we picture the Borgogno Rivata winery: a young and fresh company, based on experimentation and development. Just 5 hectares of vines surrounded by fruit trees, with living vines, never static, never definitive. The ears open and the eyes alerted for new methods, new challenges, new wines. The Garagistes: who are they? The term refers to a group of wine producers in the Bordeaux region, which emerged in the mid-90s in reaction to the traditional style of Bordeaux red, highly tannic and long aging. The Garagistes, usually with only a few handfuls of hectares of vineyards and, have developed an extremely personal style, not always close to the traditional “tastes” and often using unconventional processes. The basis for a quality production begins in the vineyard: the aim of our work is to harvest grapes that are healthy, ripe and with excellent organoleptic characteristics. For this reason we believe in the potential of traditional methods, if combined with a constant openness to innovation and development. The young age of our company and the consequent freedom of identity allow us to experiment and create a new way of “making wine”. In the vineyard we follow the disciplinary of the “integrated fight”, the directive that allows to obtain a product almost free of chemical residues. Starting from the 2018 harvest, our vineyards are certified SQNPI, acronym for “National Quality System of Integrated Production”, a goal that allows us to guarantee consumers a healthy and sustainable product. In compliance with these principles, we allocate at least 5% of natural areas in our used agricultural area (SAU), to safeguard the habitat of organisms useful for the natural containment of adversity. For example, thanks to the inter-row grassing we create a natural vegetative-productive balance that improves soil fertility. Among the integrated pest control techniques we practice sexual confusion against the moth, an enemy insect of the vine. Every year the vineyard is different, with different problems to face. It’s just through research and discussion with the close community of winemakers of Roero that we are able to fight the difficulties respecting nature. Just like in the vineyard, our choices in the cellar are not pre-established, but are based on study and observation. From year to year we try to understand the needs of our grapes, and to define an ad hoc process to express it at its best. The first thing we do is we select the grapes: only the best clusters are used for the production of wines and placed in the stalk-remover; this crusher-stemmer machine initially presses the grapes gently and then de-stems them, or rather separates them from the woody part. The must obtained is then stored in tanks where fermentation takes place at a controlled temperature. As far as red wines are concerned we carry out the ‘rimontaggio’ process, namely the transfer of the must from the bottom of the tank, by means of a pump, to the top. In this way we break the cap of marc, the upper layer of skins and seeds that is created during the fermentation, allowing for a better oxygenation of the mass and a greater extraction of tannins and natural coloring substances. At this point, the red wines undergo malolactic fermentation by raising the temperature. During this phase the malic acid, which is more bitter and acrid, is transformed into lactic acid, which is more delicate and soft. This is how we achieve more balanced, full-bodied, persistent wines with the finest bouquets. a scaling process that, by means of the sudden lowering of the temperature down to 0°, precipitates the residues that are still present down to the bottom of the autoclave, allowing for their elimination. The last stage is aging, a resting period for the wine before and/or after bottling, which varies according to the type of wine, the DOC and DOCG disciplinary and our experience. For example, as tradition has it, we refine Nebbiolo and Barbera in large wooden barrels for several months, but we don’t fail to experiment with various types of aging giving life to a wide selection of original labels. Two worlds that meet and allow you to taste the best of each territory: the power of the Langhe reds and the scents and the elegance of Roero’s wines. Come and visit us in the winery, discover how we cultivate our land, how we work our products and taste them along with us in a real Langa farmstead!